The ecobiz buzz these days is all about greening the grid, what with tens of billions of dollars in the stimulus bill for transforming the electricity system into a digitalized, interactive version of the Internet. Just on Wednesday, the European island nation of Malta announced a $91 million deal with IBM to not only create a smart power grid but to smarten up its water system as well. Water, in fact, is likely to emerge in coming years as big an opportunity as electricity for tech companies. Just as climate change is driving efforts to add intelligence to the power grid to more efficiently manage electricity usage and new sources of renewable energy, a warming world is making water an even scarcer resource. Clark’s job is to find companies – startups usually – with technology IBM (IBM) can tap for business units like its Global Energy & Utilities Industry. These days that means companies that develop sensor networks and other technologies that can be deployed across smart grids as part of IBM’s Smarter Planet initiative to essentially create a physical version of the Internet for the natural and man-made worlds – water systems, transportation, agriculture. That, of course, would generate untold terabytes of data that would need to be crunched, mined and analyzed, spurring demand for the type of software and Big Iron computing that is IBM’s forté. Take water. In California, for instance, a three-year drought has put water districts under pressure to cut their customers’ consumption while conserving every drop possible. Many districts still rely on dispatching workers in trucks to check on water quality and water levels and check for pipeline leaks and breaks. Big Blue analyzes that data and displays it on a computer dashboard that allows water managers to monitor their systems and head off problems like leaks or contamination. For example, General Electric (GE), Clark says, makes a sensor the size of a half-dollar that can detect multiple environmental conditions. IBM has pilot projects underway with some water districts but faces a business challenge: Those public agencies typically are underfunded and don’t have millions of dollars on hand to roll out smart water systems. Money is usually not so much of a problem for Big Agriculture and Clark says IBM’s early customers are corporate farming giants like Archer Daniels Midland (an ADM spokesman points out that the company is a crop processor, not a farmer) that want sensor networks to better manage everything from irrigation systems to soil conditions. Clark expects that after energy, water will be next up on the legislative agenda. IBM, along with other tech giants, appears to have the ear of the Obama administration. IBM chief executive Sam Palmisano joined the CEOs of Google (GOOG), Applied Materials (AMAT) and other tech companies last week in a meeting with President Barack Obama about investment in green technology. If Wall Street’s implosion can feel remote on the West Coast, where green tech startups largely rely on Silicon Valley venture capital, there may be no escaping the fallout from the credit crunch. Still, even those renewable energy companies tapping East Coast cash have powered ahead amid the chaos on the Street. 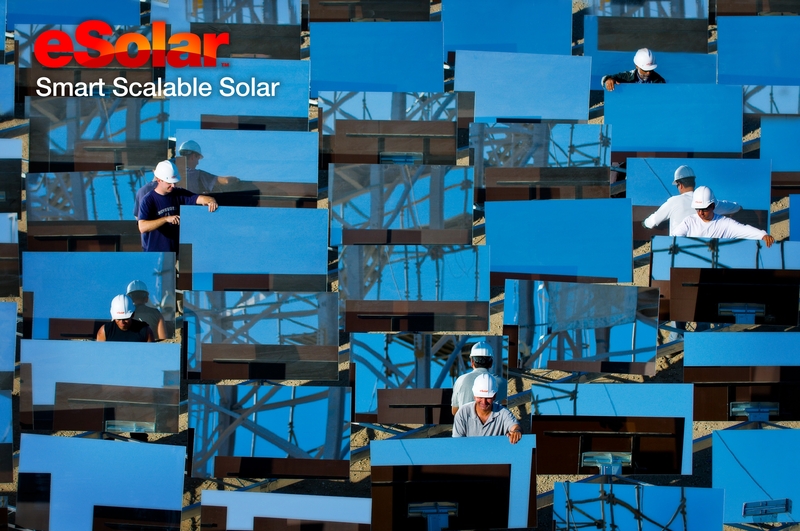 Take SolarReserve, a Santa Monica, Calif.-based solar power plant developer. A day after Lehman Brothers filed for bankruptcy last week, the stealth startup announced a $140 million round of funding from investors that included Citigroup (C) and Credit Suisse (CS). Lehman does hold small stakes in wind turbine maker Clipper Windpower of Carpinteria, Calif., and Ormat Technologies, a Reno, Nev., geothermal developer. “Lehman’s exit from wind is not good news, but it’s not the end of the world,” says Ethan Zindler, head of North American research for New Energy Finance, a London-based research firm. And while Lehman holds stock lent to it from solar cell companies like SunPower (SPWR) and Evergreen Solar – potentially diluting their earnings per share if the stock is not returned – Lehman is not a big player in solar. That’s not the case with Goldman Sachs (GS) and Morgan Stanley (MS). Both are major solar and wind investors and both were forced this week to reorganize themselves into bank holding companies to stave off shotgun marriages with other institutions. Spokespeople for Goldman and Morgan Stanley told Green Wombat that the firms’ transformation into more conventional commercial banks – at least a two-year process- will not change their green investing strategies. But if there appears to be little immediate collateral damage from the financial crisis for green tech startups, there are longer-term consequences. Solar power plants, wind farms and other large-scale renewable energy projects require billions of dollars in bank financing. But Gross, the founder of Pasadena, Calif.-based startup incubator Idealab, argues that given soaring electricity demand and fossil fuel prices, large-scale renewable energy projects will be an attractive investment, paricularly since utilities typically sign 20-year contracts for the power they produce. eSolar, which is backed by Google and other investors, has a long-term contract to supply Southern California Edison with 245 megawatts of green electricity. Gross says eSolar has a pipeline of other projects and interest in the company remains high, particularly overseas. The key for developers of utility-scale projects – particularly solar power plants – will be keeping their costs under control; not an easy thing when deploying new technologies amid a commodities boom. Green entrepreneurs tend to be an optimistic bunch, so it’s not surprising they still think the future looks bright. But they had reason to be sunny this week – amid Wall Street’s meltdown, the U.S. Senate on Tuesday passed, at long last, extensions of crucial renewable energy investment tax credits and other goodies to goose green tech, such as a tax credit worth up to $7,500 for buyers of plug-in electric cars. The Senate action now must be reconciled with similar legislation in the House of Representatives. Solar projects, for instance, would qualify for a 30% investment tax credit through 2016. PASADENA, Calif — One of the more interesting observations I’ve heard at Fortune’s Brainstorm Green conference concerned genetically-modified foods and nuclear power. Someone commented that these two things — historically the object of huge vituperation from environmentally-minded critics — are both seeing a modulation of criticism. In a session on the topic of nuclear power, Fortune’s David Whitford asked the audience how many were unalterably opposed to increasing nuclear power in the U.S. for any reason. In this room of perhaps 300 environmentally-minded Americans, only about 20 raised their hands. With oil at $116 and global warming an ever-more urgent concern, minds are opening. Not that most of those in the room wouldn’t add substantial caveats to their unwillingness to rule nuclear out. That said, the advocacy of nuclear power shown by Alex Flint of the Nuclear Energy Institute on Whitford’s panel drifted to some absurd extremes. For instance, he said that he would be willing to have a nuclear waste facility in his backyard, and that the location of a nuclear power plant “as close as possible” to his house “would be good for land values.” What is this guy smoking? In the random interesting comments category, I was struck by an amazing statistic proffered by IBM’s (IBM) Rich Lechner in a session on Greening the IT industry. There were plenty of convincing arguments being made in the room that IT and the intelligence bequeathed by computing can have a major impact on reducing energy use and carbon releases. But Lechner noted that a virtual person in Second Life has a larger carbon footprint than the average person in Brazil. His point, presumably, was that as people enter a developed economy, their carbon footprint goes way up along with their increasing use of tech.